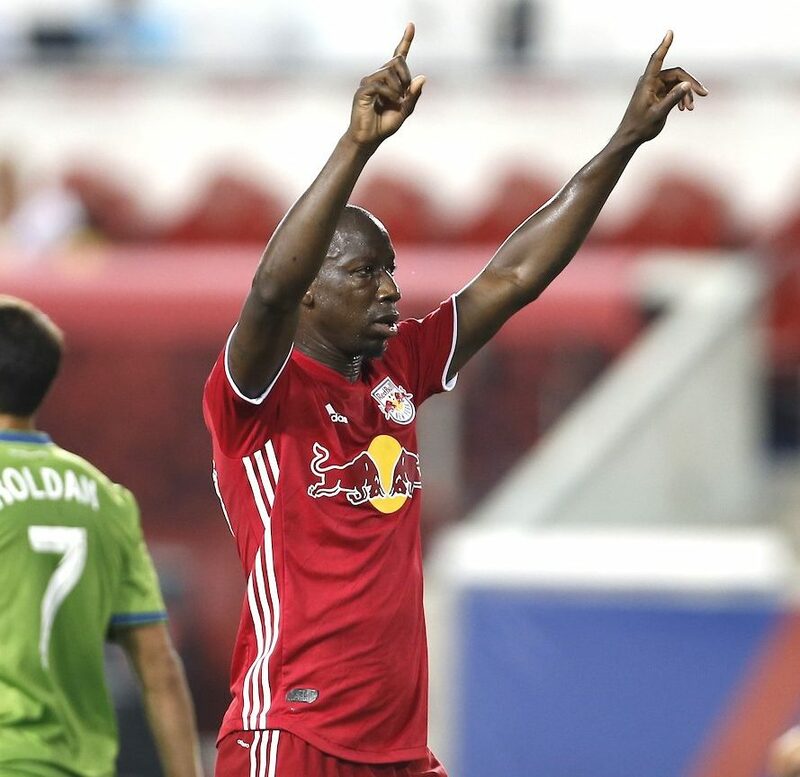 Harrison, NJ—June 13, 2018—The New York Red Bulls got back into the MLS win column on Wednesday night at Red Bull Arena, defeating the defending Western Conference champion Seattle Sounders 2-1. Daniel Royer and Bradley Wright-Phillips earned tallies for the Red Bulls and rookie defender Ethan Kutler recorded two assists in his first MLS start. Seattle got a late goal from substitute Harry Shipp late in the match to make things interesting in what was a mostly comfortable performance for the hosts. Both teams had a hard time getting anything going in the first 20 minutes on what was a steamy night in Harrison. The Sounders came into the game with a banged up starting lineup and approached the game in a defensive manner keeping at least eight players between the ball and their goal. The strategy seemed to be effective as New York had trouble completing many passes in the midfield and final third with Seattle CB Chad Marshall in particular getting in the way of several key passes. The Red Bulls would finally get their first chance in the 20th minute when a quickly taken free kick led to a powerful cross by Alex Muyl from the right, but the header by Bradley Wright-Phillips was flicked just wide of the far post. The hosts would squander another glorious opportunity in the 30th minute when the ball fell to an open Muyl in the penalty area, but his harmless shot went right at Seattle GK Stefan Frei. The former Georgetown man would get another chance in the 36th minute when his header off a corner seemed to be heading to the top left corner, but instead was plucked out of the air by Frei. Just a minute later Jesse Marsch’s men would finally get their breakthrough when Ethan Kutler played a long curling ball down the right-hand side to Florian Valot. The Frenchman would send in a low curling first time cross that narrowly avoided Wright-Phillips but would find Daniel Royer at the back post for his fourth goal of the season. Seattle nearly leveled the match in the 43rd minute when a slip in the Red Bulls defense allowed midfielder Victor Rodriguez in on a breakaway against Luis Robles. But Rodriguez pulled his shot harmlessly to the left of goal missing everything and at halftime it was 1-0 to the home side. The second half started much brighter for the Red Bulls as their trademark high-press began to have its desired effect. New York would double its lead in the 52nd minute when a corner kick fell to Ethan Kutler to the right of the penalty area. The native of Lansing, NY then sent in a curling cross that would flick off the head of Bradley Wright-Phillips and into the side netting at the back post. The goal was BWP’s 10th of the season and the sixth time that he has scored with his head this season. Soon after the goal, Jesse Marsch would go to his bench in attempt to keep legs fresh ahead of their US Open Cup round of 16 match on Saturday against the Philadelphia Union. The match this weekend will be the Red Bulls fifth match in the space of 15 days. Marsch would continue the balancing act, taking off Kemar Lawrence and midfielder Tyler Adams and bringing on Connor Lade and Marc Rzatkowski. New York would miss a golden opportunity in the 70th minute to make the game 3-0 when Valot’s shot at point-blank range was robbed by a sprawling Frei who stretched back across his body to make a save with his left hand. The rebound fell back again to Valot who had the Seattle GK helpless, but instead of simply placing home the shot the Frenchman fired the shot over the bar and into the stands. The remainder of the second half was relatively comfortable for the Red Bulls as they held a majority of the possession without too much pressure on their own goal. However, a defensive hiccup late in the match would cause a few headaches for the last few minutes. In the 87th minute, against the run of play and seemingly out of nowhere, Seattle’s Will Bruin got on the ball on the left and fed a diagonal pass on the ground to the feet of substitute Harry Shipp. The Chicago native would let the ball run across his body, before lacing a shot with his right foot off the left-hand post and into the net, ending the hopes of a shutout for a clearly frustrated Luis Robles. But that would be the last significant chance for Seattle late in the game and the Red Bulls would hold on for a 2-1 win. The exhausted Red Bulls will have one more game before getting back to a relatively normal schedule when they play Philadelphia in the US Open Cup in Philly on Saturday. The match will be their fifth game in just over two weeks during which New York has gone 2-1-1 so far. Reinforcements will be on the way for Saturday thankfully for New York as the team’s assist leader Kaku returns from international duty with Paraguay. All of these games are being played with a sense of uncertainty around the Red Bulls bench, as rumors continue to swirl that head coach Jesse Marsch could soon depart the club to become the new manager of RB Leipzig in the German top division the Bundesliga. But for now, at least, Marsch is still in charge of NYRB and all of his focus will turn to the next match in Chester in three days.